The Alaska cruise season is in full swing with many of the ships sailing from the Seattle. With so many exciting places to visit in this friendly city, it’s a great place to stay for a few nights before your cruise. 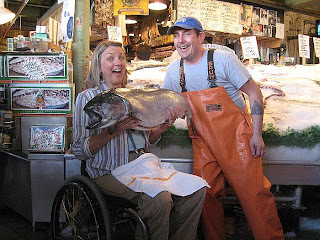 One unique attraction, Pike Place Fish Market, has quite the fan club and there’s a recipe to their success. They are one part Cirque du Soleil with the way they entertain their customers. Add in a piece of your favorite wacky teacher because they know their seafood and are happy to teach you about your dinner. Throw in a pinch of that “goofy big brother” because of their way of having fun, but also being a part of the community. Mix all of these ingredients and you find why Pike Place Fish Market has become an “experience” which has also made it into one of Seattle’s biggest tourist attractions as well as everyone’s favorite place to buy seafood. I’ve visited their store twice when I’ve been in Seattle, dragging my teenage sons with me the second time a few years ago. I say “dragging” because, well, sightseeing in a marketplace wasn’t rating as high as the Underground that they had just toured. However, flying fish and the largest crab legs they’ve ever seen in their life gave my sons an experience that they still talk about! The guys at Pike Place Fish know the essence of “community.” They interact with their guests (customers) and are active with local events. And in this time when businesses are learning about “social network marketing”; they’ve learned it, embraced it and have marked their presence. Their website is fun and which matches the personality of the business, complete with a webcam, photos, online store and blog. They tweet on Twitter and they have the most fun Facebook group I’ve come across. My enthusiasm gained a lot of momentum over that Facebook group. Every picture exudes fun whether it’s them interacting with the famous Globetrotters or the non-celebrities who stop by. That is how it came about that I called Anders at Pike Place Fish Market. I explained that my agency’s specialty of accessible cruise vacations for slow walkers and wheelchair users represents about 60% of our business, and that our http://www.wheelchaircruising.com/ website houses photos showing accessibility of cruise ships and ports. Talk about accommodating! Anders sent some wonderful photos showing that same fun and enthusiasm with a couple of customers that were happ y to assist with the project. While we have some attractions and cruise lines which have been pretty good at supplying photos, there are even more which aren’t so accommodating. But in the same exciting spirit that they do everything else, Pike Place sent photos. If you get to visit Seattle, visit the marketplace. But if you aren’t lucky enough to see them in person, you can get to know them further and order from them online at their website. P.S. Get free smoked salmon from Pike Place Fish Market- Book an Alaska cruise for 2009 or 2010 through our office between 6/17/09 - 7/31/09. Send an email to Connie with the header "Flying fish blog" and, in the email include the names of the travelers and the name of our agent who is working with you. Your salmon will be sent ot you upon return of your trip.